1. Croup audio sound clip (croup audio file), click play button below, or click here to listen. 2. A second Croup audio sound clip (croup audio file), click play button below, or click here to listen. 3. A third Croup audio sound clip (croup audio file), click play button below, or click here to listen. 4. Stridor audio sound clip (stridor audio file), click play button below, or click here to listen. 5. A second Stridor audio sound clip (stridor audio file), click play button below, or click here to listen. Note: If you want to embed one of these audio files on your website, the code is here. Croup is a condition that is typically the result of a virus such as the common cold, adonovirus, or respiratory syncytial virus (RSV). When your child has croup, his voice box (larynx) and windpipe (trachea) become inflamed. This inflammation and swelling causes the already narrow trachea to become even narrower, which can cause a dangerous medical scenario for your child. Croup is usually preceded by cold symptoms such as a stuffy or runny nose and/or fever. As the upper airway (trachea and larynx) becomes inflamed and swollen, the child usually becomes hoarse sounding. Remember your great aunt Sally who smoked for 40 years? Suddenly your baby will begin to sound like her! Croup is also usually characterized by a loud cough that can sound like a barking seal or dog (this is usually the tell-tale sign that your baby has croup). There are several croup audio files you can listen to, above. Stridor is also common during croup, which is a hoarse high-pitched sound when the baby breathes in; to hear what stridor sounds like, click one of the links above! Most parents recognize croup for the first time at night when getting a baby ready for bed, or if the baby is fussy or crying. There is no reliable scientific explanation for why croup tends to become apparent at night, but most emergency room doctors can attest to the fact that they tend to get the most cases of croup late into the evening and night. If croup remains untreated, the airway can become dangerously swollen, causing it to be increasingly difficult for your child to breathe. You may hear a high-pitched squeaky noise when your baby inhales, and you might also notice that your baby is breathing quickly and has short breaths. In very serious cases, a child can show signs of a lack of oxygen such as paleness and/or a bluish tinge around the mouth. Croup itself is not contagious, but the virus that caused the croup probably is contagious. It is best to keep other children or vulnerable individuals away from your baby until he or she seems to have recovered (usually in about a week). If another does get infected, it is not likely that they will also get croup, but they will likely develop cold-like symptoms. Treatment Option 1 (Our #1 best humidifier): TaoTronics Ultrasonic Humidifier (about $60-70) This is the best humidifier option we could find on the market! This unit has 3 speed settings (low, med, high). The low setting is just as quiet as the Pure option above, and the medium and high settings are still very quiet overall. This humidifier has a much larger tank than the Pure, coming in at just over a gallon of water. It is rated for 15 hours of humidifying, which tells us that this unit does an excellent job getting the moisture into the air. How do we know? Well, if it has a bigger tank and is running out after 15 hours, then all that water is going somewhere! 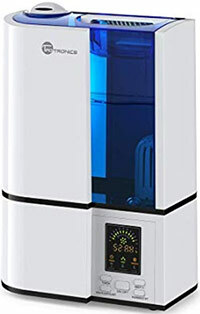 This humidifier also has several advanced features and a nice LED screen. It has a built-in humidity meter to tell you what the current conditions are in the room. It has a sleep timer you can set at night, a rotating nozzle, and a sleek profile. Refilling is a bit more cumbersome than the Pure because it's a bigger tank to fit under the faucet (we used our kitchen sink). Cleaning is the same as the Pure unit: clean out the tank and brush off the metal ring. The reliability on this unit is fantastic, and the company is very responsive to any questions or concerns. Other than being a bit harder to fill, there are no other drawbacks to this humidifier other than the higher price tag. Not for use with aromas or essential oils. Treatment Option 2 (another of our best humidifiers): Seneo Ultrasonic Cool Mist Humidifier and Aromatherapy. About $40-50. This is an awesome humidifier for several reasons. First, this cool mist humidifier is whisper quiet: in our testing, we honestly thought it was malfunctioning because it was so quiet we didn't think it was even on! There is a continuous speed adjustment with about 25 settings, and from low to medium is extremely quiet. It's also very simple to refill: pull the blue part off, unscrew the cap on the bottom, and fill it up with 2.6 liters (over half a gallon) of water from your sink. In our testing, we turned it on low at 8pm and it was still running at 7am with about three inches of water remaining in the reservoir. If the water gets too low, it has an auto shut-off for safety. It has a subtle night light with 7 different colors, and you can choose whether to have the light on or off independently of the humidification. It also has a little tray hiding on the back that you can put a drop or two of essential oils into (like lavender! ), which will give the room a nice subtle aroma. The reliability ratings are excellent, which is surprisingly hard to find with a humidifier. Finally, there are no filters to clean or replace. You will only need to clean two things: first, clean the reservoir as you would with any other humidifier (usually once a week). Second, use the included little brush to clean the silver ring in the bottom of the humidifier (maybe once every few weeks). 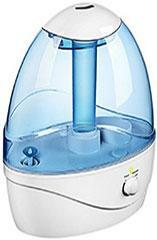 Overall, this is an excellent humidifier with some simple options. Cons? Well, you cannot swivel the spout to point the mist in certain directions. Other than that, we think it's excellent! Most cases of croup are quite mild and can be treated at home without the help of medical professionals. Of course, call your pediatrician immediately if your baby is showing signs of developing croup, as they will likely have customized instructions or helpful hints for you. They may also want you to come in to the office so they can hear it first-hand and make sure everything is OK. That said, mild cases of croup can be treated by exposing your child to moist air. This can be done in several ways, but some of the most popular and effective ways are to join your child in a steamy bathroom for 10-15 minutes, use a cool mist humidifier, or bringing them outside into the cold air for a short period of time. First, the bathroom method: let the hot shower run for 10 minutes until the bathroom becomes humid and steamy, then go and sit or stand in the bathroom with your baby. A warm bath also works well, unless your baby is running a fever. Run the hot shower for about 10 minutes before you go into the bathroom, then fill the tub with warm water for a nice bath in a steamy bathroom. Second, the cool mist humidifier method: run a cool mist humidifier in your baby's bedroom or wherever your baby spends his or her time during naps and nighttime sleeping. Be certain to use filtered water or purified water; do not use tap water due to the high mineral content. If you notice a white powder accumulating on your furniture or floor, your water contains too many minerals. Realize that if the white powder (elemental calcium) is ending up all over the room, it is also ending up in your baby's lungs. Third, the cold outdoors method: take your baby out into cold weather (with warm clothes, hat, and gloves on!) for 5-10 minutes and allow them to breathe in the cold outdoor air. Cool air can help reduce the swelling and inflammation in the trachea and will typically stop your baby from coughing. In more serious cases of croup, there are several treatment options. Many doctors believe that oral or nebulized (breathable) steroids such as epinephrine (adrenaline) will quickly reduce airway swelling and restore normal breathing for 1-3 days. It is difficult to prevent croup itself, but you can certainly reduce the odds that your child will contract a virus the will lead to croup. To help prevent your child from catching a virus, keep them away from other sick children, and wash your and your child's hands frequently.